Members of Tamil Makkal Mandram, Inc. seated below a kolam drawn by KarthigaiPriya Govindarajan, (far left). 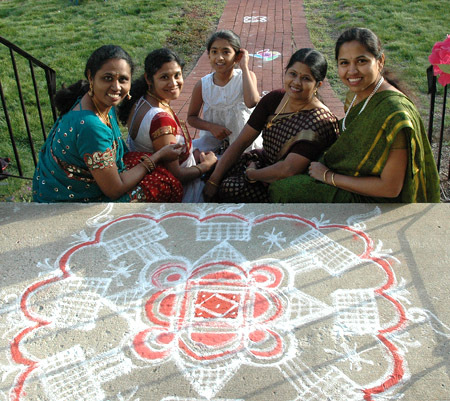 The women and young girl pictured above gathered in Newton Corner last Friday to share their expertise and pure delight in making kolam. 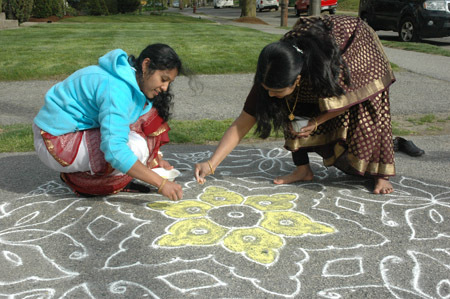 This ritual form of drawing with rice flour or stone dust is customary throughout India. 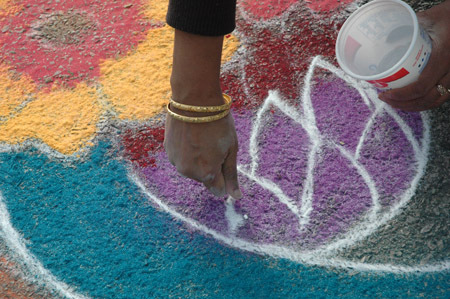 For these women, learning to draw kolam was part of growing up in Tamil Nadu. 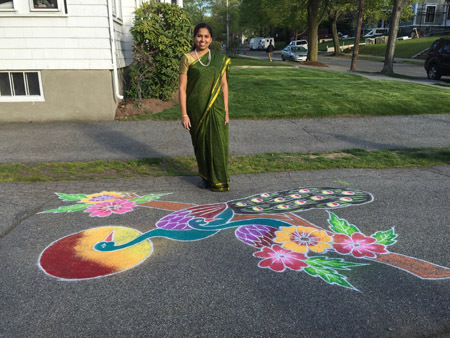 Having relocated to New England, they are members of Tamil Makkal Mandram, Inc., a community organization that fosters the ongoing practice of Tamil expressive traditions. 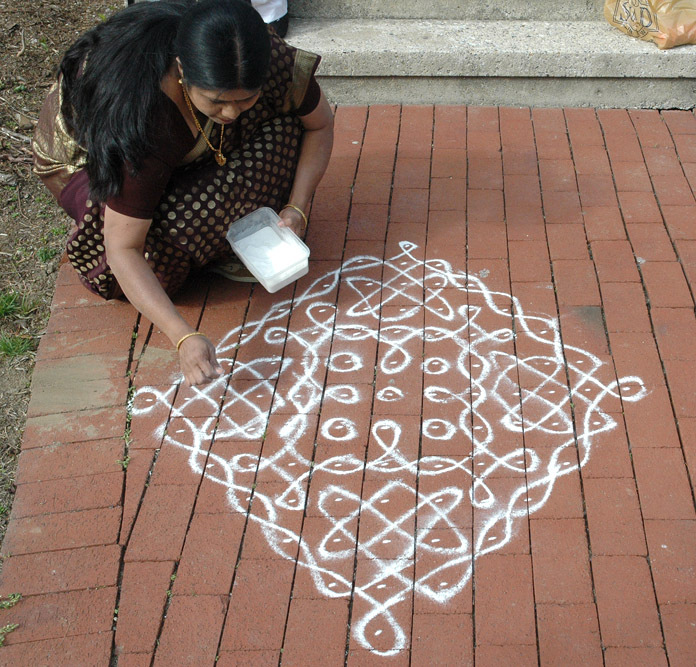 We are thrilled that they will be joining us in the Folk Craft area of the Lowell Folk Festival this July to demonstrate kolam art. A proper blog post will be coming from MCC intern, Nora Martinez-Proctor, who spearheaded the effort to find these talented artisans. But for now, we thought we’d share a few images and video from last Friday’s demonstration. 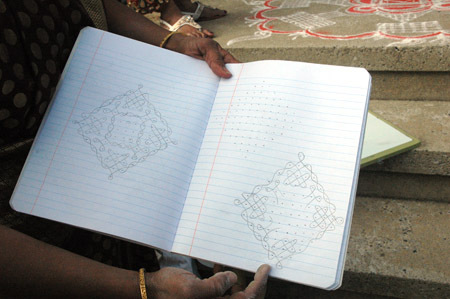 Having first laid a grid of dots using white stone dust, Sathya Ramesh begins outlining a pattern of butterflies. Geetha Raju helps by filling in with yellow. 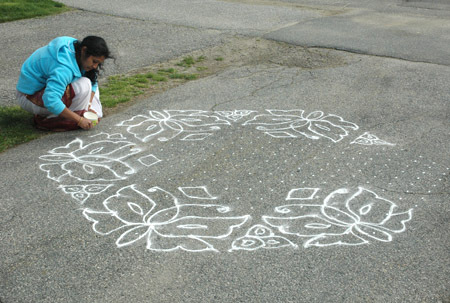 Geetha Raju puts the finishing touches on her kolam. She then shares with us her composition book in which she draws geometric patterns. Symmetry plays a strong role in kolam designs. Some kolam designs break free from symmetry, as in this drawing depicting a male and female peacock by Sridevi Karthikeyan. Sridevi Karthikeyan posing with her finished kolam featuring two peacocks. Rain has since washed away all traces of kolam. Stay tuned for more about the daily and ephemeral ritual of kolam artistry and whence it came. Photos & video by Maggie Holtzberg.